On July 23, 2015, the Financial Conduct Authority (FCA) announced a change in the way customer complaints need to be handled. This affected all customer-facing staff at financial organisations in the UK. 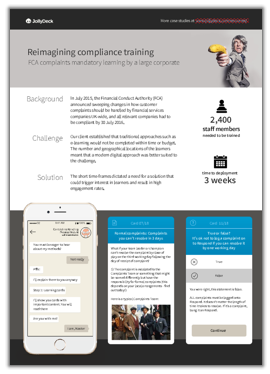 Learn how JollyDeck helped a large corporation in the finance sector train 2,400 staff members about new regulations 4 times faster and 6 times cheaper than their sister company. Previous post: Chat with your virtual Coach!